The MetalCloak Lock-n-Load™ Replacement Control Arm for Radius Suspensions (metalcloakpatents.com) is precision engineered to solve the most common problems with radius arm suspensions. If your Upper Control Arm measures between 16" and 17" from eye to eye, the Lock-N-Load can bring new life to your Radius Arms. Note: MetalCloak Recommends You Have a Suspension Specialist Align Your Jeep After Installing Any Suspension Components. "Typical" Radius Arm systems inherently bind causing premature bushing wear and excessive stress on bracketry. The Lock-N-Load solves that problem. 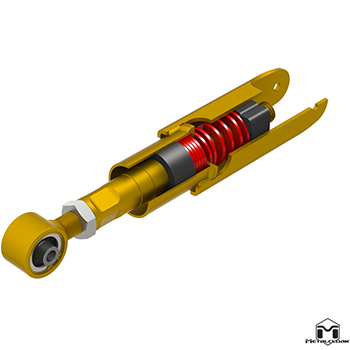 The unique design of the Lock-n-Load allows you to "LOCK" the control arm in a static "solid" state for on road safety and road handling or "LOAD" the arm to unleash the capabilities of your radius arm suspension! 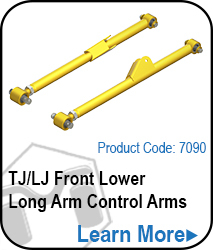 To lock or load the control arm is easy; it does not require any additional adjustment for length -- turn one way to lock and the other to load - the control arm internals keep the correct length with no fuss! 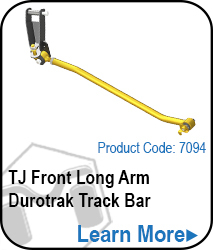 The Lock-N-Load is designed to ONLY work the front of a linked radius arm suspension. The Lock-N-Load ONLY replaces the Passenger side upper control arm (your current driver side upper control arm remains in place). The upper control arm must have a joint that connects at the lower control arm and a clevis that connects at the axle end. The Lock-N-Load will currently work on most any radius arm suspension that the passenger side upper arm measures between 16" and 17" from eye to eye. 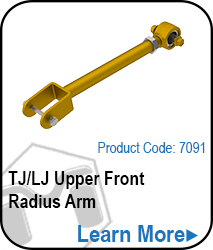 Note: If your radius arm set-up meets these parameters it will work whether you have a TJ or a JK or some other custom build (though it has only been designed and tested with the TJ in mind). HOW DOES THE LOCK-N-LOAD WORK? compressing one spring and extending the other. At full stuff, the Lock-N-Load compresses. Notice there is always compression and resistance. for increased stability in daily driving. extension for additional off-road articulation and to relieve stresses from bushings and brackets. 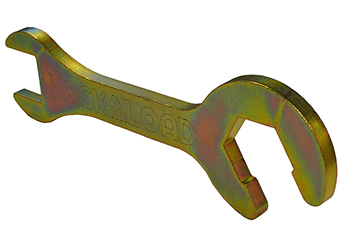 The Lock-N-Load wrench is specifically designed to work with your Lock-N-Load Control Arm. 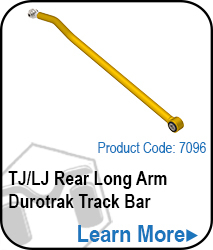 This tool is designed to easily adjust to lock or load your control arm with ease. Made of laser cut 3/8" Hot Rolled Steel. Wrench is finished with a Gold Zinc finish for a classic high end, long lasting MetalCloak look.